I just had to let you know that we did indeed find Little Bear’s twin brother! Thanks to your blog and the Pezeccas, our son is the happiest little boy on the planet! Our family is forever grateful. I plan to keep checking the site in the event that I can return the favor for someone some day. 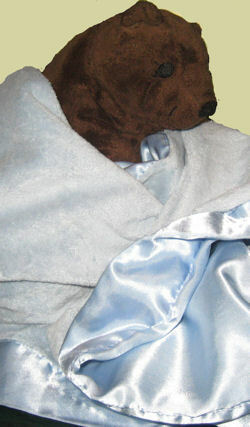 I’m searching for a small chocolate brown plush bear that was purchased at Ikea in CT in Feb. 2005. It was paired with a large fuzzy brown bear as a set. I need it as a replacement for one that my 3 1/2 year-old son lost this weekend while we were shopping at Woodbury Commons. It was a baby gift from one of my closest friends and has traveled everywhere with us for the last 3+ years — on numerous trips to Texas, North Carolina, Georgia and even South America. Little Bear was also my son’s nap time and bed time must-have, and he’s been crying at night when he realizes he doesn’t have him. If you can help Melissa find this Ikea Small Chocolate Brown Bear, THIS SITE IS NO LONGER ACTIVELY MANAGED. Please use Our FREE FACEBOOK GROUP, including #090208-2 in the subject, .